The Michelin Pro 4 Race Service Course tyre delivers the best trade off between sports performance and a long tyre life. The achievement of the Michelin engineers is to have simultaneously enhanced its speed, safety, agility and resistance all at the same time. The Michelin Pro 4 Race Service Course is not only safer but it also an average 16% faster when cornering on wet road surfaces. Wider lateral bands for optimal grip at all angles of lean. New compounds incorporating new elastomers and silica for extra grip at the shoulders. Was looking for an alternative to the ubiquitous Conti GP4000's training and sportives. These Mich Pro4 SC are not the latest generation Mich 'Power' series but they run and corner really nicely. No issues so far, I will prob be getting more. A really good training tire. 64 year old ex-racer with 45 years under my belt on tubs and the last 11 years on clinchers for training. Right at 158 pounds and usually run the tires at 100-105 PSI for the 700x23. The only complaint I have with the Pro 4 Service Course is the rear wears out quickly on Ohio's chip & seal road surfaces and that is barely justifiable for what is basically race rubber. Grip is very good. Ride feel is excellent. They roll well. I recommend these for fast training rides. Great balance of ride and handling. Good durability. Second time I have purchased these tyres. Stunning product in any road conditions oh and they look cool too. First time I've tried the Pro 4 and done about 250 miles on them so far so can't comment on durability. Really light and marginally faster than my Conti 4000s & 4 seasons and grip the corners like a Staffie with a stick! Also more comfortable with less vibration at higher psi. Red walls give a beautiful finish to my bike and had lots of admiring comments. With sale discount these are a fabulous summer tyre, love them!! Really great and reliable tyre, great service. The tires have performed just as expected - great grip on the roads in all conditions and super quick. And the red walls that match the red accents on the bike make it look faster than ever! This is my second set of Michelin Pro 4 and I've been riding the current set for over 2500 miles without a flat.. They are wearing up the center of the tire so it's time to replace them. Great tire! I like these tires. They are highly predictable in the handling. I started riding the first Michelin Pro Race (1) back in 2000 and have moved along with the product since then. This tire has better grip than the prior versions (1,2,3) in my opinion. They are about 200g when new. When paired with about an 80g tube they have a nice light ride. I've had two high speed flats on these tires, both times hitting debris on the road and both times on on the front and both times came to a safe stop without injury. Excellent tyres, been using them for some time now and as yet never had puncture and they roll very well. Just completed Newcastle to London 310 miles with no problems. Excellent service from Merlin. Great tire. Can't tell much of a difference from the Pro 3 tire, but that is not a bad thing. So far so good. Quite easy to fit. Got the 25's to see what they were like, seem to roll and corner fine, potholes don't seem quite so jarring. On my Giant TCR advanced there isn't a lot of clearance but nothing to worry about. 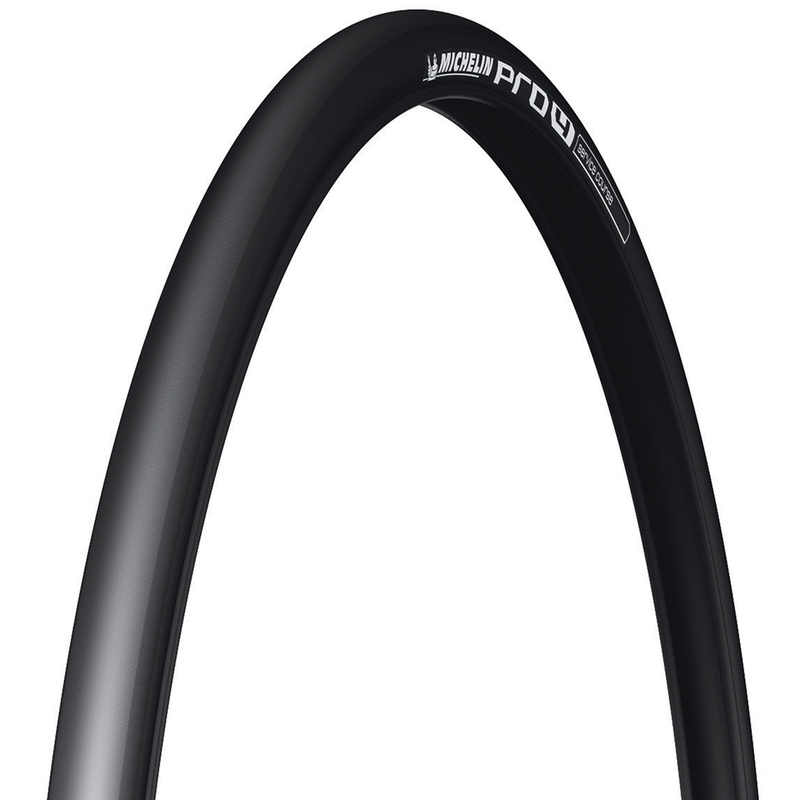 Excellent product from Michelin, the 25mm tyres in the Pro 4 range are a real favorite. This is a great all around tire at an even better price. Rolls fast, grips well and is comfortable. Huge improvement in ride quality over my Conti Gator Hardshell tires. Did not think tires could make that much difference. Brilliant tyres, 25's are just are good as the 23's. Great durability and grip. I've been using the Pros since Pro2's. They have not failed me. Used Pro3's and 4's for the last 4 years and never experienced a single flat. Don't let the smooth surface fool you. These tires grip wet roads. Great Tire. A big improvment over the Michelin Pro Race 3 in terms of wear and handling. Rolling resistence is good too. I've had Michelin Pro 3's before & read good things about these. I have not been disappointed! Going from Schwalbe Ultremos to these, I noticed an improved "feel" straightaway. They roll well, feel great & seem to grip well too, but only ridden in the dry on them so far. They are a tiny bit heavier than the Schwalbe's but don't seem as prone to the loose threads that the Ultremos seem to suffer from. Recommended. Just upgraded to these tyres, feel great, and a lot faster. Having lost confidence with my tubeless tyres following a tear and deflation, I went back to my old favourites the Michelin Pro 4 Service Course Folding Tyre. Really struggled to get them on my Shimano Ultegra Front Wheel (I think this wheel has a big rim to accomodate the tubeless tyre) but managed to fit them on my Mavic Kysriums with just my fingers. Completed a 175 mile 2 day Sportive with them and they ran really fast without and issue. In addition, my bike was really easy to find amongst the hundreds of others with those "electric blue" side walls !!! I also have the Pro 4s on my winter bike and only had one snake bite last year. All in all, an excellent tyre that performs well in the wet and the dry that shouldn't let you down. Bought some of these tyres for 2012 trip to Gran Canaria. They performed superbly especially down the twisty hairpin bends on the long hot descents. They had a fairly decent life span and I have replaced them with the same tyre. Needless to say Merlin were cheapest and my first stop now when it comes to components or accessories. Love these tyres, so much better than the Pro Race 3. They seem much more robust but even more sticky. They seem to wear very well and offer very reasonable puncture protection for a race standard folder. Best tires on the market in this price range. They are the only tires I ride on. Big improvement on pro race 3 Roll well but seem to be more comfortable. 400 miles so far no cuts! !